It's hard to believe that EIGHT years ago today I went to Maine Greyhound Placement Services and met this breathtaking 4 year old greyhound. He was white with two gray patches over his ears. At that time one of the gray patches also covered most of his eye though these days it has faded to white except on his ears. 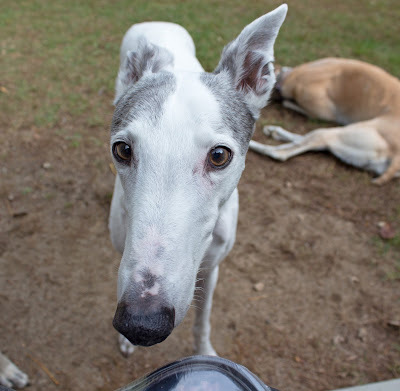 This greyhound was a serious handful but I was so taken with his beauty that it didn't matter. I chose him. He was strong and had no leash manners. Heck he had no manners of any kind. Early on he seriously injured my rotator cuff when he decided to take off after a leave or a bag or something interesting to him but unseen by me. He was always doing stuff like that. He never listened. Anyone who knows him now never believes the stories of his early days. What I didn't understand about Blue then was that despite his rowdy behavior, he was a very gentle and sensitive boy. He had the misfortune of coming into a home that already contained a small brindle heart dog. He got a bit short changed in that respect as Girly Girl shone very brightly in Mumma's eyes. Being the sensitive boy that he is, I think he felt the role of second fiddle that I had cast him in. Because of this difficult start it took us a long time to build a strong relationship. 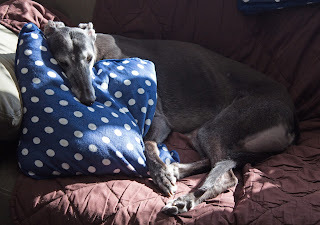 For most of the time that Girly Girl was alive, I had the distinct impression that Blue, while happy enough with me, would be just as happy with anyone. That has changed with 8 years of cohabitation. He's my big Poppy, my Buggy Boy. I can't imagine life without him in it and I think that he has come round to loving his Mumma as much as she loves him. I still think he's breathtaking. I have had the amazing privilege of watching him become a handsome old man. He still has flashes of the silly goofy boy he was in his salad days. He never met a blanket or a bed that he didn't like. He has a fondness for body pillows. He's lost a fair number of teeth but we've made accommodations for that. Since he can no longer easily pick up his beloved sweet peas (they keep falling out of all the gaps) we now mash them up into a thick sweet pea slurry that he can eat over his dinner. I truly can't believe we've had 8 years together already. Blue manages to charm everyone he ever meets. His requests for attention and his greyhound lean are legendary. There is a long list of people who would be happy to take Blue "off my hands" if I ever wanted to give him up. That list started on the day after I got him with his first vet and is now longer than I can keep track of. But Mumma will never be taking anyone up on their offer. Happy Gotcha Day Royal Bluejay. There will always be a big boy bed and a man cave for you here. Seven years ago today a tiny black dog came squirming into the world. I didn't know her back then but I have no doubt that she immediately started bossing around her littermates and making countless demands of her poor exhausted mother. 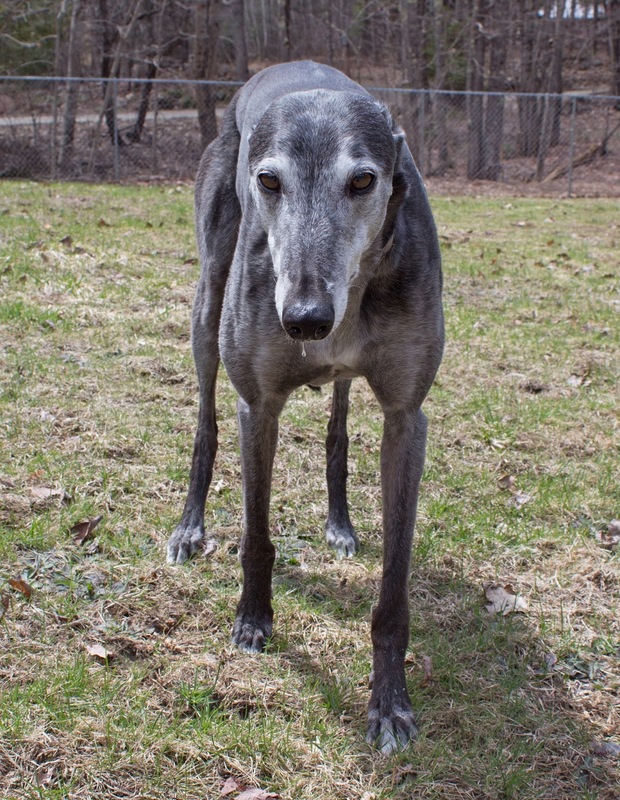 As she grew, she underwent the same training as all the other greyhounds in hopes of preparing her to race. As usual, Bettina had her own ideas about what lay ahead for her. She was sent out into the world for her maiden race and she didn't get much farther than that when they decided to close down her track. I'm not saying that her arrival was the cause of the closing of the track, but we don't really know now, do we? They opted not to ship her to any other tracks. That's a decision that I have pondered for a long time. At first I figured that she just must not have been very fast. Except she IS pretty fast. I have a sneaking suspicion that it has to do with her sassiness and her tendency to play a little dirty. I've watched her hip check her brother on numerous occasions if he was on the verge of overtaking her. I can also envision her spending her 20 hours a day in her crate making an unholy racket at the indignity of having to be in a crate at all. She was known as "Crazy Mo" in the rescue kennel (a fact that absolutely no one disclosed to me until she was safely in my home for almost a year). That was because it routinely took 2 or more volunteers to wrestle her back into her crate once she had been liberated. Nobody puts Baby in a corner (or a crate). In Mumma's spot on the couch. finding that she came up woefully short. Bettina, of course, had her own mind on the subject. She saw a gravy train and by god she was getting on it. So at the ripe old age of 2, and after 6 months in the rescue kennel, the cheeky, bossy hound that is Bettina wormed her way into our household and my heart. Now after almost 5 years together, I can't imagine life without her. I've watched her go from a sleek black dog to a greying middle aged hound (she actually started turning grey about 3 days after she came home with me, so we've been watching the grey thing for a long time now). She's lost none of her sassiness. About the only thing that Bettina compromised on was the crate. Occasionally she'll go in one voluntarily but she does expect to be rewarded handsomely for it. Happy Birthday to you my tiny biscuit. You're Mumma's diamond in the rough. Polish though I might, you've remained as sassy as ever. I am looking forward to the rest of our adventures together and to watching you grow into a bossy old lady.